Stoughton junior David Peters has been selected as the HockomockSports.com Player of the Week, presented by Morse Insurance, for Feb. 17 through Feb. 23. Peters is the 21st player chosen as Player of the Week for the 2018-19 school year and the 11th player in the winter season. Peters took home the title in the 55-meter hurdles at this past weekend’s All-State Meet at the Reggie Lewis Center in Boston. 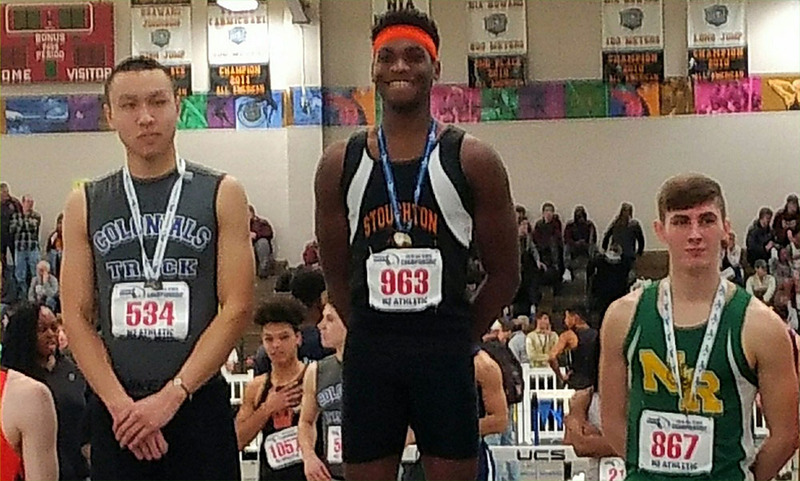 He set a personal best with a time of 7.46, edging the second-place finisher from Acton-Boxboro by only 0.01 seconds, to bring home first in his first year racing at the indoor all-state meet. Peters also took part in the long jump, finishing ninth with a leap of more than 21 feet. 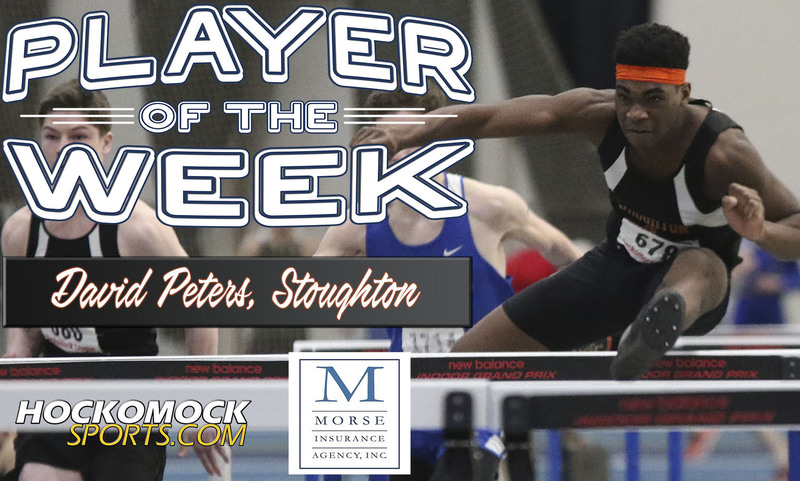 Peters has been on a roll over the past few weeks, showing steady improvement in his times, while winning the title at the Hockomock Championships and the Div. 3 meet. He won the Hocks with a time of 7.62 and then won the D3 meet with a time of 7.59 before setting a new PR to win at all-states. This is the second time that Peters has been named Player of the Week. He also earned the honor last May after winning the 110-meter hurdles title at the outdoor D3 meet. Peters went on to finish seventh in the event in the all-state meet two weeks later. The MIAA held its All State championships at the Reggie Lewis Center on Saturday. Below are the team results and individual results from Hockomock athletes. 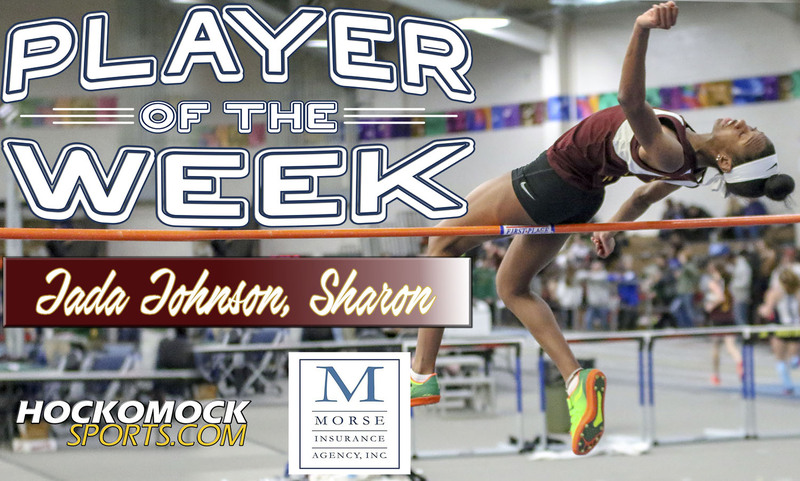 Sharon junior Jada Johnson has been selected as the HockomockSports.com Player of the Week, presented by Morse Insurance, for Feb. 3 through Feb. 9. Johnson is the 19th player chosen as Player of the Week for the 2018-19 school year and the ninth player in the winter season. 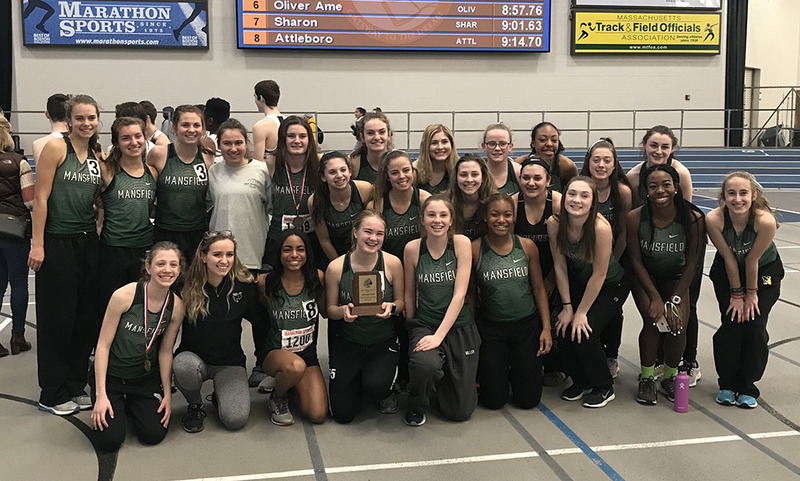 Johnson put in a strong performance at the annual Hockomock League Indoor Track Championships this weekend at the Reggie Lewis Center in Boston. She took first place in three events: the 55-meter hurdles, long jump, and high jump, helping the Eagles take fifth overall (second among Davenport teams) with 60 points. In the 55-meter hurdles, Johnson took first in a time of 8.43, which was 0.3 better than the second-place runner and 0.4 faster than her time at last year’s championship meet. Johnson then took first in the high jump, clearing five feet, seven inches. The next highest jump was five inches lower. In her third event of the day, Johnson jumped 18 feet, 3-1/2 inches to win the long jump competition by nearly a foot. Her distance set a new Sharon record as well as a new meet record, breaking the record she set last year. It was also almost a foot longer than her jump at last year’s indoor championships and three inches longer than her jump at the outdoor championships last spring. Johnson has been a strong performer for the Eagles in both indoor and outdoor track for several seasons. The Eagles were second in the state in Div. 3 last winter, with Johnson taking second in the long jump, fifth in the high jump and third in the hurdles at the state meet. She also finished second in both the long jump and the high jump at last year’s Div. 2 EMass Outdoor Track Championships, which the Eagles won. 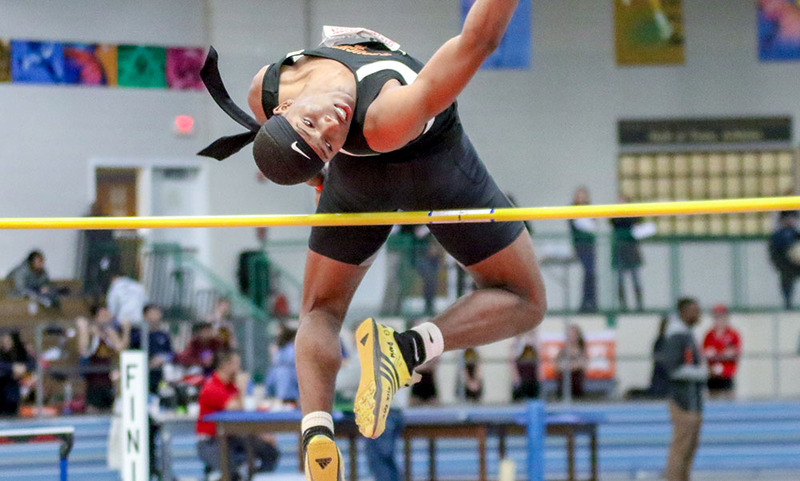 The Hockomock League Championships were held at the Reggie Lewis Center on Saturday morning. Below are the team results and the top eight finishes for each event. Click here for complete results from Athletic.net. 2. Catherine Hanewich, North Attleboro – 5:33. In middle school, twin sisters Ashley and Courtney Daggett took part in an after-school track program run by the Attleboro YMCA. At one of the sessions, they were given the opportunity to try high jumping for the first time. Nearly a decade later, they are still jumping together. The Attleboro High grads are entering their final indoor and outdoor seasons at Stonehill College looking to extend the program’s dominance in the NE-10 (six straight conference championship meet titles) and taking advantage of a few more months competing with each other. High jump is definitely a family affair for the Daggetts. Their father Tim was also a jumper at Attleboro High and their grandfather competed at North Attleboro. So, when the YMCA offered the twins a chance to learn the event in the summer before freshman year of high school it was only natural that they jumped right in and, as it turned out, it was a perfect fit. The sisters joined the Bombardiers and became standouts. While Ashley was out with a stress fracture during their sophomore season, Courtney cleared four feet, 11 inches “out of nowhere,” breaking her personal record (PR) by three inches. It was the moment that she realized collegiate high jump was a possibility. While the styles are the same, how the sisters have gotten to their results has been very different. As she did in high school, Courtney makes massive gains on her PR and then works to get back up to that level. She landed five feet, 5.25 inches during the indoor season and then hit five feet, 7.25 inches during outdoor. Both stand as program records. Ashley is more of a consistent performer, who gradually builds up her PR (five feet, 4.25 inches for indoor and five feet, three inches for outdoor) at smaller increments. 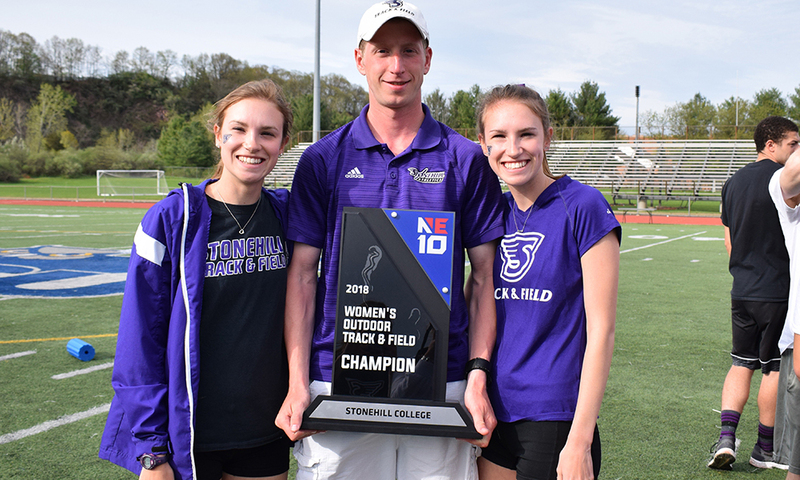 The sibling rivalry is still there, but years of competing together (and as part of a team of six jumpers at Stonehill) has added perspective on how important it has been to go through this journey together. Through all their success, including being named to the USTFCCCA All-East Region teams last year (Ashley for indoor and Courtney for outdoor), all the struggles when jumps weren’t landed, or the injuries that slowed them down at various points in their careers, both sisters insist everything has been better because they have accomplished it together. Stonehill will be back in action on Jan. 12 at the Beantown Challenge hosted by Harvard at the Gordon Indoor Track. Below are the official 2018 Hockomock League Girls Indoor Track All Stars, selected by the coaches in the league.